Ford is selling the last retail 2014 Shelby GT500 Convertible in Reno during the inaugural Hot August Nights Auction presented by Barrett-Jackson. The very last 2014 Shelby GT500 Convertible will be a one-off factory custom car and will be sold at no reserve during the inaugural Hot August Nights Auction presented by Barrett-Jackson. The last retail 2014 Shelby GT500 Convertible will go across the auction block with the proceeds being donated to benefit the Brain Injury Association of America. The organization has been championed by Indy 500 winner Parnelli Jones who will be signing the special Shelby GT500 for the new owner. The winning bidder of the 2014 Ford Shelby GT500 Convertible will be able to create a one-off factory custom car. They will be able to choose any interior, exterior and stripe color combination offered by Ford on the 2014 Shelby. This will be the last retail model and will likely bring big dollars and become a highly collectible car. The new owner will be getting one of the world’s greatest muscle cars. And the only thing better than a 2014 Ford Shelby GT500 with the most powerful production V8 in North America, would be an open-air version to enjoy that 662 horsepower even more. The convertible variant is the fastest open top model Ford has ever built and offers superb handling and will launch from 0-60 in less than 4 seconds. 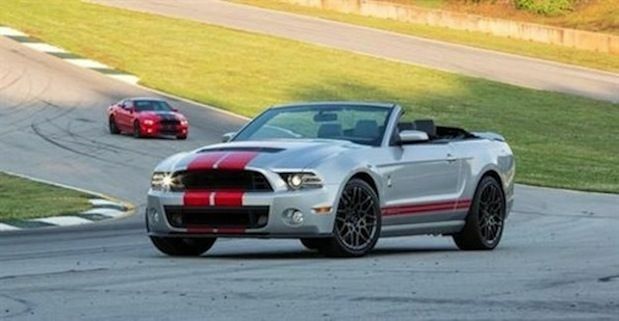 Ford improved everything on the Shelby GT500 the previous year and it carries over to the 2014 GT500 Convertible. The 5.8-liter V8 pumps out 662 hp and 631 lb. ft of torque. The V8 is the most powerful production V8 in North America and can generate track speeds of of more than 200 mph. Last year, the Shelby GT500 Coupe and Convertible were upgraded with a larger and more efficient supercharger which forces more air into the 5.8-liter V8. Other improvements included new heads, an all-forged engine rotating assembly, updated camshaft, a new carbon fiber driveshaft and upgraded clutch, transmission and axle. Ford increased the cooling capacity with a new higher-efficiency intercooler to handle the extra heat created by the extra power. Parnelli Jones was introduced to the BIAA when his son, Page Jones suffered a severe brain injury during a Sprint Car race. The initial prognosis was grim, “yet with the support of his family, he recreated a fulfilling, productive and joyous life.” The family hopes the 2014 GT500 Convertible auction along with an upcoming documentary entitled, Godspeed: The Story of Page Jones, will raise awareness of the importance of rehabilitation for those who suffer from traumatic brain injury (TBI). At Hot August Nights, Ford will be offering both Ride-and-Drive and hot laps experiences in the parking lot of the Atlantis Casino Resort. The Ride-and-Drive will feature the Ford Explorer, Focus and Mustang. Ford fans will also be able to “test their mettle” running hot laps in performance vehicles like a Shelby GT500, Focus ST and Fiesta ST. The inaugural Hot August Nights Auction in Reno will take place August 8-10 where the last retail 2014 Ford Shelby GT500 Convertible will be purchased by one lucky bidder. For more information go to HotAugustNights.net.